The big news from the Wisconsin elections Tuesday: Gov. Walker is out; gridlock is in. Badger State voters waited in record numbers in long lines in a light rain to send a mixed message about where they want the state to go in the next four years. They narrowly voted in Democrat Tony Evers, but also voted to give the Republicans decisive wins in the state Senate and Assembly. They also voted out Republican Attorney General Brad Schimel to give Democrat Josh Kaul a narrow win. Lt. Gov. Kleefisch is out of office as part of the Walker team in favor of Mandela Barnes. So, the state will see highly divided government starting in January. The Republican Party will control the state Senate with a 19-14 majority, adding to its margin by one seat, and the Assembly by about the same wide margin that it held before the election. The Democrats will control the governor’s and AG offices. 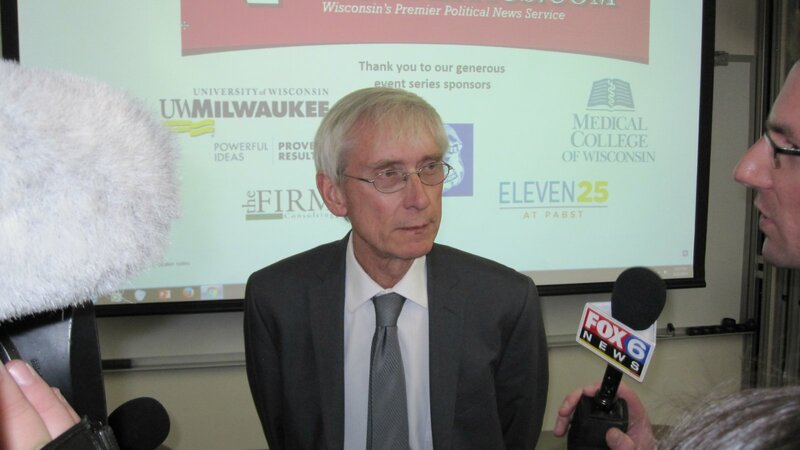 The agenda of the two parties are markedly different, so the bet has to be that not much will get done in Evers’ four-year term. Both sides will have to forget about policies where they have deep disagreement, but may be able to finds areas of compromise. The areas ripe for compromise are funding for accelerated road work, support for K-12 and university education and coverage of pre-existing conditions in health care. Leaders from both parties have expressed support in those arenas. Compromise is a good thing in politics, because it enables policy advancements that both parties can live with and therefore the general populace can accept. Compromise binds. Stoked by President Trump, the hallmark of today’s politics is divisiveness. An antidote to that rancor is ticket splitting, and that clearly happened here Tuesday in a big way. Election analysts will find that out as they dig into the numbers in coming weeks. Other areas where the two parties might be able to work together are big issues that got little or no attention in the hard-fought, sometimes nasty campaigns. That would include the need to reorganize the University of Wisconsin System on a regional basis, more work on the opiod crisis, added stimulus for entrepreneurs and the burgeoning startup ecosystem that are reinventing the rust belt, the recipe for poverty in the extremely high rate of births to single mothers, the labor shortages and many more. In short, there are plenty of issues on which Evers can work with Assembly Speaker Robin Vos and Senate Majority Leader Scott Fitzgerald. I bet they are already talking. If they choose instead to push divisive issues, like school choice, Act 10, the Foxconn subsidies, abortion and tax cuts or hikes, they will just cancel each other out. My guess, given the voters’ elevated level disgust with excessive partisanship, is that the party that is the least compromising will be the party that loses the most in the 2020 elections. Of course, the biggest question in the aftermath of the national mid-term elections is what impact did President Trump have on the outcomes. The spin machines will be working in high RPMs so we will have to sort through a lot of political hoo-ha. The one clear telltale in Wisconsin is the reelection of liberal U.S. Sen. Tammy Baldwin by a very wide margin over conservative Leah Vukmir. State Sen. Vukmir tied herself to Trump with Superglue, and she got clobbered. In reality, she had little choice because her opponent in the GOP primary had tied himself even tighter to the president. Trump’s shadow hangs heavy over the GOP, if not the nation as a whole. Despite having his hands tied, the president will explain away the loss of the House of Representatives by asserting that it is normal for the party out of power to gain seats in off-year elections. Needing someone to throw under the bus, It was Paul Ryan’s fault, not his. But a loss is a loss. And gridlock will ensue on the national level as well the Wisconsin level. That appears to be what the state and national voters want. Have Wisconsin voters really “voted to give the Republicans decisive wins in the state Senate and Assembly”? Or did the majority of Wisconsinites actually vote for Democratic senators and assemblypersons, but were thwarted by gerrymandering? I don’t have the time to search out and type in all the votes from over 100 senate and assembly races to see if this is what happened, but I’m pretty sure it did. Yes. Our Election results are directly attributed to extreme gerrymandering. How do we gets this changed when the districts will always vote the same way? We need to “redistrict” using the Iowa method. “gridlock”? I think not. This is what the founders called “checks and balances”. I find the column far too optimistic about potential collaboration across the aisles. Partly, as Barb from West Bend and Transit Rider suggest, gerrymandering had more to do with divided government than any message that the voters may have sent. Unless the GOP abandons their budget busting tax cuts and the Foxconn deal, there won’t be any resources to do much. Republicans are likely not to budge on their wasteful corrections policies that could provide some freed up resources for reallocation to other priorities. Speaker Vos’ initial comments on Medicaid expansion and legislative changes to executive branch authority aren’t exactly promising. Governor elect Evers may be perceived as less than a skillful negotiator, and his winning margin won’t create a lot of incentives for compromise. Well said, Mark. GOPs don’t seem willing to listen to the new Governor or the people’s votes when it comes to Medicaid expansion or removing the “dark store” loophole. And while 50% may not have voted for Evers for Governor, 54% of Wisconsinites didn’t vote for GOP legislators. “The people” chose (by a small margin) to reject Walkerism and the ALEC agenda and (by a larger margin) to support progressive policies on health care, taxes and education. Evers should push hard on the GOP Legislature to justify their out-of-step positions, and the budget cuts that will need to be made to keep those out-of-wack priorities in place. Torinus knows this, but is too much of a WOW County GOP oligarch to admit it.